In this Borgata online casino review, we’re going to present its most attractive games, as well as some other features available on their website. Borgata is one of the most popular real-life casinos in Atlantic City. Situated at Renaissance Pointe, this casino spreads across over 161,000 square feet. With more than 250 table games, like roulette, poker, and blackjack, as well as 3,400 slot machines, Borgata is a real gambling gem of the East Coast. In addition to the brick-and-mortar gambling options, they’ve launched an online casino, with even more playing features. Opened in July 2003, Borgata is one of the largest casino venues in Atlantic City. The tower that hosts it is the third tallest tower in Atlantic City. It’s also a well-known landmark on the Atlantic City marina. One of the pivotal events in the development of this casino was the opening of the Water Club by Borgata Hotel Casino in 2008. This move propelled Borgata even higher on the list of the best casinos in New Jersey. Part of the profitable MGM online casino group, this casino soon became one of the most popular gambling venues in the States. Thanks to its far-sighted management, who realized that the internet is the next big thing for this industry, the online version of Borgata casino was launched in 2013. Borgata wouldn’t be one of the most respected casinos out there if they didn’t have a plethora of game variations. For starters, there are more than 320 different slot games on the online Borgata casino, appealing to many different types of players. The themes of these slots vary from ancient times, like Egypt, to more modern settings, such as rock clubs or Baywatch. In this Borgata online casino review it’s also important to mention their jackpot slots. These gambling features, also called progressives, are based on a grand pool that’s created from small individual bets. The person who wins the game takes the pool’s entire funds. You can play ten different jackpot options in this online casino, winning a large amount of money with only a small investment. The themes, like Sweet Hawaii, Biker Pigs, or Money Boat, are amusing and relaxing for online players. When it comes to Borgata poker games, you can play twelve different games, from Jester Poker and Jacks or Better to Regal Poker and Deuces Wild. Lovers of table games, on the other hand, can’t count on too much variety in this online casino. Still, there are ten different table games, such as European and American Roulette Pro, Craps, and Texas Hold ’Em Bonus Poker. Every renowned casino offers a proper number of blackjack games, and Borgata isn’t an exception. Players discussing this casino in their Borgata casino reviews heap praise on Multi-Hand Blackjack Pro and regular Blackjack (IGT). What differentiates Borgata from most other casinos is their $20 slots bonus for each and every newly registered player. They also organize an additional bonus contest every Friday, in which 20 players altogether receive between $25 and $100 bonuses in cash. Apart from that, players can win a Borgata Experience voucher once a week. This package consists of a night at the hotel, tickets to the casino, and dinner for two. Together with the Borgata online bonus code, these are great incentives to start your Borgata gambling in a jiffy. 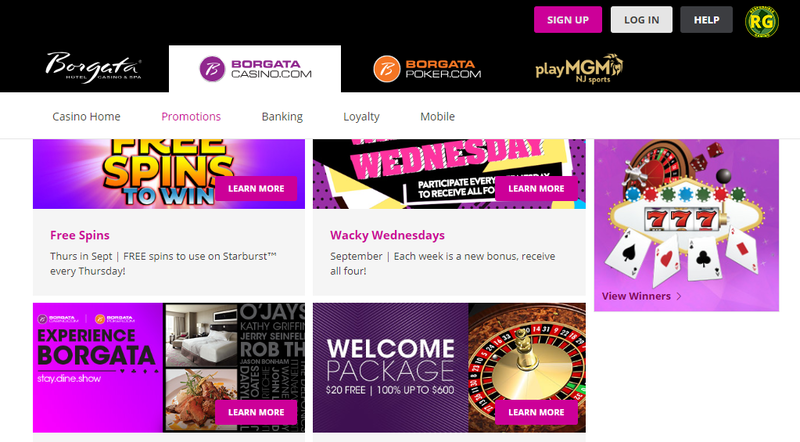 On the Borgata online casino, you can get rewards during their special Play & Earn promo campaigns. This summer, the players on this website were able to collect iRPs (iReward Points) and exchange them for cash bonuses. During these specials, the more games you play, the more points (i.e., cash) you can earn. One of the best Borgata online casino promotions is the Endless Summer $5,000 Sweepstakes. The main prize in this contest is $1,000 in cash. To take part, you’ll need to activate your participation in the My Promotions section. After that, simply play the casino games and keep earning your iRPs. As for their ongoing promotions, the $600 welcome package is one of their promotional trademarks. In a nutshell, for every dollar you deposit, the casino gives you a $1 bonus, up to $600. While there are higher welcome packages out there—for example, Mohegan Sun online casino reviews show theirs is $1000—you should know that not all welcome packages are available all the time, but Borgata’s is. Finally, Borgata opens the Cash Back Wednesday bonus on players’ deposits. During these promotions, Borgata returns 20% of the cash you’ve lost during the promo period. The only requirement for this return is that you must deposit at least $100 into your Borgata account. Keep in mind that to be eligible for these promotions, you must enter your Borgata online login information on their website. In addition to playing games on the Borgata website from your desktop or laptop computer, there’s also an iOS app, as well as an Android app. That means that you can play your favorite games from any computing device or gadget. When it comes to the mobile casino features, you can count on all the games accessible on the regular website. So feel free to play roulette, ordinary slots, jackpot slots, poker, blackjack, and all the other games. Also, new games are added as we speak (and gamble), which means that the gambling experience via Borgata’s mobile apps is getting even more exciting. Therefore, download Borgata casino apps for when you want to try your luck on the go. What’s extremely important for online casinos is the website organization and user experience. In theory, every gambling website should meet the UX demands of a regular website. When you get to the Borgata website, you can choose from several key tabs: Featured, New Games, Exclusive, Slots, Jackpot Slots, Table Games, and More. When you click on the More link, the falling menu leads you to Promotions, Withdrawals, Banking, and Casino Apps. To keep this Borgata online casino review concise, you can easily navigate to all the vital parts of the website from the homepage. As you register and choose a game, everything goes pretty fast and smoothly. The load speed is 5.4 seconds, according to GMetrix. The games are organized on a grid and their icons are easily visible, which can save you some time while choosing which game you’re going to play next. When you enter any particular section of the website, be it table games or Borgata online poker, there are always two icons in the upper left corner. One of them leads to the homepage and the other one will take you to the Borgata Hotel website. These details can be helpful during the game, especially the latter, in case you decide to stay a night or two at the hotel and play some games at the venue. Players who are entering the online gambling arena for the first time will probably have some questions about security. Reading other NJ online casino reviews, it quickly becomes clear that people are genuinely worried about the safety of their assets and private data. The Borgata casino is licensed and registered by the New Jersey Division of Gaming Enforcement. They’re also licensed for internet gaming. This enforcement administration regularly controls and tests the conditions under which Borgata organizes its games. You can contact customer service via phone or email; there’s no live chat. If you’ve experienced any serious difficulties playing Borgata casino games, you should phone the customer support team—there’s an unwritten rule that email inquiries are better for more general questions. When you call, they’ll either resolve your problem or redirect you to someone who can help you. Still, their email-reply squad is committed to their players, as well, and they usually respond within 24 hours. As just about any Borgata casino review will tell you, they’re a reliable online gambling company. Part of that reputation comes from protecting your data. To do this, they use strong 128-bit encryption protection, operated by Thawte Security. As for website registration and account safety, you’re protected by strictly controlled login identification protective features. When website operators find a player taking part in any fraudulent or deceptive actions, they ban such players from the website. The overall gaming experience in the Borgata casino online environment is more than satisfying. The website itself is well organized and it offers a plentitude of different games. What’s more, within these large groups, you can opt for hundreds of slot games, as well as a large number of poker games and blackjack. Only the table games section offers a limited number of playing features. When you take into account the bonus incentives and regular promotions that reward avid players, Borgata still stands out as one of the most enjoyable casinos on the market. Therefore, use this Borgata online casino review as a guide to help you get around the Borgata website and kickstart your gaming in this e-casino.